It’s a question of focus. Since the dawn of the automobile in the late 1800s, the focus of every car’s cockpit area has been the steering wheel, and by extension, the activity that should occupy the majority of the driver’s attention while behind said wheel; namely, actually driving the car. In the past few years, though, with the emergence of large in-dash navigation screens on even basic commuter cars like the Ford Focus and VW Golf, the steering wheel’s visual preeminence in the average car’s interior has been steadily watered down. 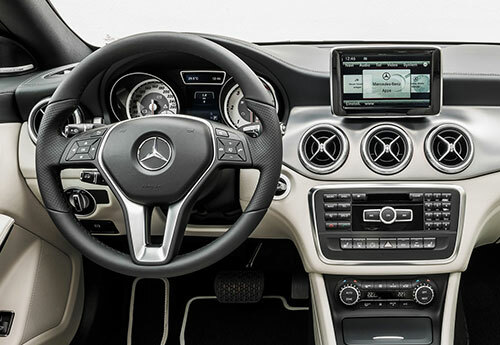 Whenever I consider a photograph of a new car’s inside, my eyes are pulled in two different directions, alternately drawn by the steering wheel and then by the massive screen squatting in the center console. As an enthusiast, it creates a kind of uncomfortable tension in my brain where I’m subconsciously unsure of the car’s emphasis simply by glancing at the interior. There’s a visual competition going on in the cockpit, a conflict where before there was certainty, simplicity. So is this design shift just a personal preference, a nit-pick without larger implications? No—I don’t think it overstates the case to say that the uneasy power-sharing arrangement going on in the modern car’s interior is a bellwether of a changing societal relationship with the automobile. Since their inception, cars have been made steadily easier to drive. Engineering ingenuity has progressively done away with the need to manage things like spark advance, choke setting or even gear changes. The tedious chore of driving now approaches the convenience of taking a stroll down the street or cooking a meal in a microwave oven. Start the car, alternately press the “go” and “stop” pedals, occasionally turn the large circular thing positioned in front of you while enduring a period of isolation in your transportation appliance, and arrive at your destination. Why not give the car’s occupants a little television to play with during the trip? It’s not like anything else of note is making a demand on their time. I’ll admit I’m being a bit obtuse; I know full well that not everyone is a driving enthusiast, and nowhere is it written that every car owner shall read the entire owner’s manual from cover to cover and make every effort to bond with their automobile. And yes, I multitask while driving; I fiddle with the stereo and talk on my cell phone, among other things. The tipping point for me hinges on the design statement, the visual prominence given to the in-dash screen and the emphasis it usurps from the steering wheel. Aesthetically, the stereo is just one of many secondary controls, and I can put my cell phone away, but a built-in touchscreen is always there, always demanding my attention. And even if I choose to ignore it, the design decision to place it on equal footing with the steering wheel comes from someplace; it wouldn’t have been made if there wasn’t a demand for it. As drivers, we have a finite amount of attention to devote to the range of tasks available behind the wheel. I’m just saddened to witness a symbol of the shrinking slice of our “attention pie” devoted to the act of driving.